SURREY, BC – Spirits from Central City Brewers & Distillers won an impressive 8 medals at the 2018 San Diego Spirits Festival. As one of the most prestigious competitions in North America, Central City is extremely proud to have won more medals than any other distillery in 2018. The lineup of Lohin McKinnon whiskies won an impressive 3 medals at the 2018 San Diego Spirits Festival! 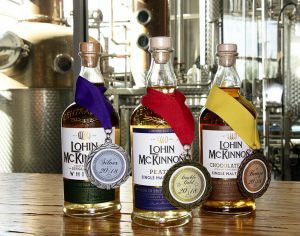 Lohin McKinnon Peated Whisky was awarded Double Gold, Lohin McKinnon Single Malt won Silver, and Lohin McKinnon Chocolate Malt was awarded Bronze. Also, a soon to be released product line, Bitters By Christos, won 5 medals including Double Gold medals for Aromatic Bitters, Rosemary Bitters and Mole Bitters and Silver medals for Cherry Bitters and Orange Bitters. Lohin McKinnon whiskies faced stiff competition in a blind tasting format. The Lohin McKinnon Peated Whisky was one of only 4 Double Gold medals awarded across all whiskies entered into the competition. Bitters by Christos products won an impressive 3 of the 8 Double Gold accolades given out at the 2018 festival. Lohin McKinnon whiskies continue to shine in 2018 now with a combined 10 awards from institutions including the Canadian Whisky Awards, Sip Awards, Canadian Artisan Spirits Competition and the prestigious San Diego Spirits Competition. “The recognition of Lohin McKinnon’s core and seasonal whiskies in 2018 has been amazing and we couldn’t be more excited for what’s to come in 2018 and beyond. We aim to produce world class products and these awards re-affirm that we are doing exactly what we set out to do.” says Dustan Sept Director of Marketing at Central City Brewers and Distillers. Internationally, and all spirits were judged on their individual merits and attributes. The 2018 bottle judging competition was well supported with 225 entries in various categories from vodka and gin to whiskeys, rum, agave spirits and liqueurs. Spirits were presented to judges in coded NEAT glasses in a blind tasting format. No spirits bottles were visible to judges at any time until the competition was finalized. award-winning, premium craft beer and distilled spirits, made without compromise. Based in Surrey, British Columbia, CCBD was voted Canada’s Brewery of the Year in 2010 and 2012. Their Red Racer brand has become a cult icon among craft beer enthusiasts throughout North America. Founded in 2003 as a brewpub and liquor store in downtown Surrey, CCBD celebrated its 10th anniversary in 2013 with the grand opening of a brand new, 68,000 sq. ft. brewery and distillery on Bridgeview Drive. It opened a second restaurant in downtown Vancouver, Central City on Beatty, in 2015.